Alejandro Valverde (Movistar) lost his overall lead in the Vuelta a Espana today after getting caught in a crash as the peloton was split in crosswinds. Yesterday’s stage winner conceded the red jersey to Joaquim Rodriguez (Katusha) who finished in the main group of contenders 55 seconds ahead of him atop of the first category finishing climb. Britain’s Chris Froome (Sky) moved up to second just one second down, with Alberto Contador (Saxo Bank-Tinkoff Bank), the other key contender, in third place at five seconds. The stage victory was taken by Simon Clarke (Orica-GreenEdge) who easily outsprinted Tony Martin (Omega Pharma-Quickstep) after the pair survived the day’s early break. 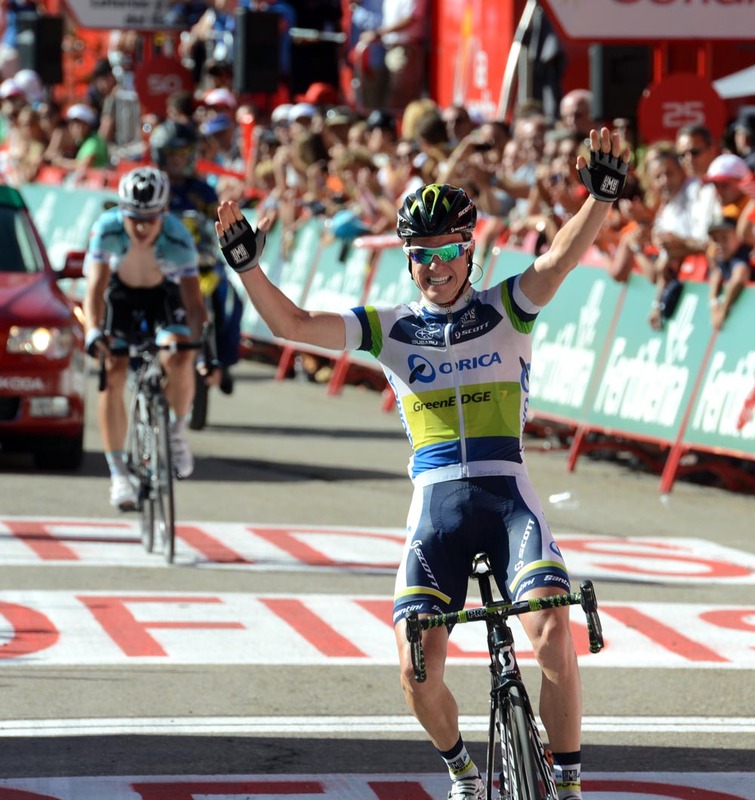 It marked the Australian’s first ever professional win in what is his first ride in a Grand Tour. The crash, involving several riders, happened near the front of the bunch inside the final 50km just after Sky and Katusha had moved towards the front. With the bunch splitting into five parts under their impetus, Valverde -who started the day with an 18 second lead- was forced into making a bike change and then trying to chase back through the convoy with team mates. There will no doubt be some debate as to whether his rivals’ teams should have eased up on hearing news of the race leader crashing, but Sky had already started their offensive when the accident happened. On hitting the final 13km climb to Estación de Valdezcaray, Valverde took to the front of the chase and came within 15 seconds of regaining the reforming peloton. But as Saxo Bank’s Daniel Navarro took to the front with Contador, Froome and Nicolas Roche in tow, the group fragmented again and the elastic stretched out once more. After Navarro peeled off with just over 5km to go, a stale mate set in with neither Contador nor Froome wanting to commit to the escape in what were still windy conditions on the climb. While Roche freely rode up the road to other dropped early breakaway survivors, Froome and Contador sloped back into the Katusha led main group. While this didn’t see enough of a slow-up for Valverde to get back on, it assured the front pair enough of a margin to contest the win -a fact apparently lost on Spaniard Marcos Garcia, and worth recalling as the day’s comedy moment. The Caja Rural rider soon jumped clear of the bunch and bridged across to Roche’s three man group before outsprinting them for fourth place at the line. Not realising Clarke, Martin and lone third placed finisher Assan Bazayev (Astana) had all finished ahead of him, he kissed his hands, reached for the sky and threw back his head in jubilation. 15. Chris Froome (Gbr) Team Sky at st.
5. Robert Gesink (Ned) Rabobank at st.